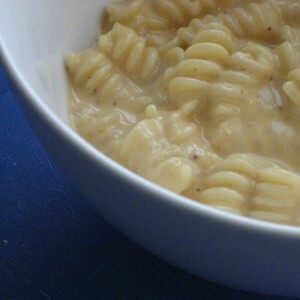 What’s better than macaroni and cheese when you need a little decadent comfort food? What I love about this version is that it tastes rich but it isn’t – and its cheep to boot. As I have said many times before, I am on a budget, and as of last week it became a tourniquet. Despite money being diverted to investments in my future, I must continue to eat like a queen, and queens eat cheese (this is speculation). Last week, as loan documents were being processed and I was feeling poor, I opened the fridge and despaired that there was simply a bag of cheddar cheese, milk, butter, expired eggs, and a tube of tomato paste. What on earth was I supposed to do?!? After five minutes of dismay – duh. MC. So, off I set, only slightly concerned that the previous three times I had whipped this up I was disappointed at the grainy consistency and the lack of cheesy deliciousness. As it turned out, my lack of ingredients was my savior. I believe that my problem had been that I was trying too hard. This time, I finely minced one small yellow onion and one clove of garlic, and added it to my saucier with butter and olive oil, over low heat. While that was becoming translucent, I added some salt, pepper and county dijon mustard – just a little because it intensifies the flavor of the cheese (yum), and a little sweet paprika, mostly for color. After about 5 minutes, I whisked in 2 tablespoons of flour and let it cook for a few minutes. Then I added about 1 and 1/2 cups of 1% milk and let that come up to a simmer. (This process of combining fats, like butter, with flour is called a roux, which is a thickening agent.) By the time the sauce reaches a simmer, the roux will be at its full thickening capacity; you may need to add more milk if the sauce is too thick. I then added about 2 cups of cheddar cheese and the sauce was done. This whole process takes about as long as boiling the water and cooking the pasta. The final product was my best yet – even the leftovers were cheesy and delicious Next time you want Macaroni and Cheese – make your own!